GROUP CLASSES Below is a list of upcoming workshops open to public enrolment. More will be added as they are confirmed. Bookings are through the venue listed. Email me if you want me to come to your group. PRIVATE TUITION is available if you prefer to have a one-on-one class. You can have a class specifically tailored to you, learn in the privacy of your own home or come to my studio. Contact me to discuss. TAILOR A CLASS If you have a group of people who want to learn a particular aspect of feltmaking or sculpture, I can tailor a class to your groups particular needs and travel to your venue to teach your group. I have been teaching feltmaking skills and sculpture since 1994. This has included workshops in High Schools and Primary Schools, for private community groups as well as teaching courses at a University level. I am currently a sessional lecturer in sculpture at National Art School, Sydney. 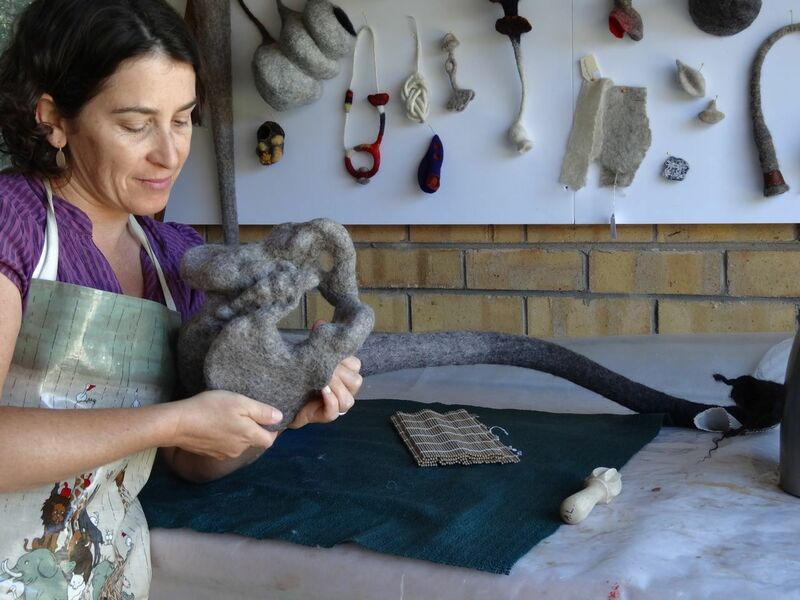 Hand-made felt is a wonderful, malleable medium that can form complex shapes, creating an eloquent and intriguing medium for contemporary sculpture. Learn the fundamental felting techniques, making seamless three-dimensional forms using resist patterns, and modelling solid felted shapes. Anita Larkin discusses the use of felt as a metaphor in artwork, considering its properties of insulation, its primal natural origins, its history as a protective shelter, its absorption of sound and moisture, and its tactile qualities as points of investigation in a sculpture. She shows examples of felted wool sculptural objects from the 5th century BC through to those of modern artists such as Joseph Beuys and Marion Borgelt. Drawing and collage exercises will also be utilised throughout the course to develop ideas for sculptural forms. Anita Larkin derives narrative in a sculpture by joining disparate collected objects together. Students will learn various simple methods of joining their own found objects together using hand tool skills. The class will also discuss methodology for creating sculptures that are engaging for the viewer, and discuss the development of conceptual artworks from found objects. It will be an opportunity to learn what makes a sculpture constructed from junk much greater than just the sum of its parts. Skills learnt will be directly dependant on the student's particular objects they are working with, but will include basic assemblage techniques, screwing and gluing, pinning to create strong seamless joins, riveting and shaping of soft metals, making your own rivets using metal tube, and modifying objects by using modelling materials. This is a week of alchemy, of animating the inanimate, of creating story and sculpture out of discarded objects. Using your found objects we will assemble sculptures by screwing and riveting. The workshop will then explore methods of felting around parts of the sculpture and objects. Learn different ways to accommodate the migration of the fibres around a solid object. You may felt around the entire object or part of it, experiencing contrast with the softness of the felt. Known since Neolithic times, felt has the ability to form intriguing shapes. In this introductory workshop un-spun wool fibres will be felted into sculptural shapes using agitation and soapy water. Learn fundamental techniques of felting hollow forms using a resist, then vary amounts of wool fibre to make unique organic structures. Learn how to plan a 3 dimensional object using a 2d resist. Explore the wonderful realm of sculpture in felt. Felting around found objects alleviates the need for constructing resists and working a flat felt into a rounded felt. The found object (if left inside the felt) can provided support and weight to the felt. There is often a pleasing contrast between hard materials with the softness of felt when parts of the object are left to protrude. This workshop explores practical methods of felting around different found objects. The found objects can be left inside or cut free after felting to create intriguing hollow shapes.